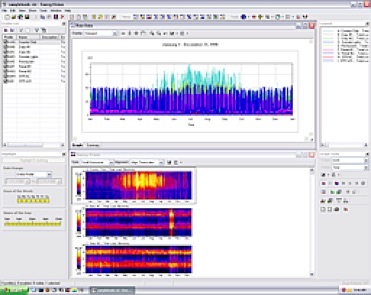 EnergyProbe™ is a full-featured software application designed for energy analysts, utility load researchers, large account managers and building performance simulation engineers to help explore, summarize and critically visualize and analyze electric and gas interval load data. 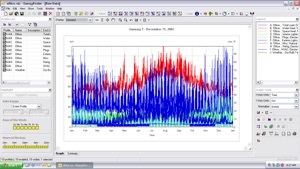 Because it can process almost any type of time-series data, it is equally useful as a general purpose data visualization tool for a wide range of measurements such as weather, industrial process control, and other interval demand or consumption measurements. What can EnergyProbe™ be used for? You not only see the big picture in the form of raw graphs and energy prints, but you can view the data in aggregate, day profiles, time-of-use periods, scatter plots and in many other informative ways. These alternative views help you to quickly spot patterns and irregularities in individual profiles, compare a single profile between different time periods, and to summarize, compare and identify relationships between several profiles. EnergyProbe™ offers the user a quick and easy way to visualize data in several different informative and interactive “views” which give insight into your data not available in any other energy analysis software. 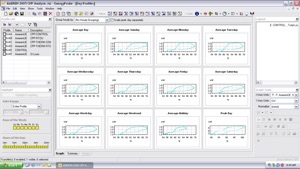 There are more then a dozen unique views of the data, everything from Raw, Aggregate and Day Profile Views to sophisticated ones such as the Coincident Peak, Time-of-Use (TOU) and Rate Calculator views which unveil details often ignored or overlooked. The Load Curtailment View gives utilities and customers a way of managing and analyzing the effects of load reduction events in both real time and after the fact. Using ongoing forecasts, which can be customized for each customer, the Load Curtailment View is able to calculate the degree of curtailment and the rebate earned based upon a fixed amount for energy saved, pre-determined bids, or interval spot prices. The Rate Calculator can be used to accurately calculate and compare a customer's annual or monthly costs under different utility rates or the difference between two profiles with the same rate. The user friendly Rate Wizard allows you to enter new rates and estimate class revenue from a rate you design. Rates can be created with 1 to 12 user defined seasons, energy and/or demand blocks, ratchets and even optional Time of Use (TOU) periods. This powerful tool gives the user a breakdown of monthly costs based upon energy, demand, customer charges and taxes and provides a method of quickly analyzing how energy dollars are being spent. Powerful data manipulation and editing tools turn EnergyProbe™ into a virtual “swiss-army knife” of energy analysis. They allow the user to interactively modify profiles in an assortment of unique ways: everything from intelligently “shifting” data from one year to another, to cropping, truing up to known billing determinants, aggregating, resampling, shifting peak load to off peak periods and much more. Import and export wizards for most industry standard data formats allow the user to quickly read and analyze their data. Custom text import configurations can be created and saved allowing quick access to commonly used data formats. EnergyProbe™ is web-enabled, and includes the ability to download data from a growing list of data providers via your company’s private network or the internet. It can serve as an extremely flexible and powerful tool for analyzing energy usage in near real-time. EnergyProbe™ is designed to integrate easily and seamlessly into your data analysis workflow. Graphs, images (EnergyPrints, Time of Use Settings, legends, etc. ), and tabular spreadsheet data can be directly copied out of EnergyProbe™ in a number of standard clipboard formats and pasted into your preferred document, spreadsheet or presentation creation tool (e.g. OpenOffice, MS Word, Excel or PowerPoint). Creating reports and presentations specifically tailored to your, or your customer’s, specific needs can be accomplished more quickly and easily than ever before. This 30 page guide will walk you through the basics of using EnergyProbe™, explaining the most common methods of viewing your interval data and ideas on how to use the various features and tools to make your energy analysis tasks easier and more efficient. The EnergyProbe™ Getting Started Guide is available as a PDF download here. The EnergyProbe video tutorial provides a complete walkthrough of all the EnergyProbe features and capabilities. This comprehensive screencast can serve as an ideal training tool for new and experienced users alike. View the tutorial here. A demo version of EnergyProbe™ is freely available to download and evaluate. 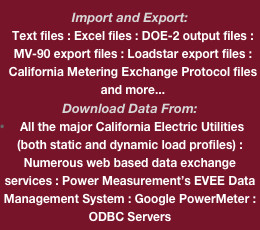 Until it is registered, EnergyProbe™ will only open the included data files, will not save data, and is limited to downloading online data only from the PG&E dynamic load profile website. You can download the EnergyProbe™ installer here. To learn more about the most recent improvements and bug fixes, view the EnergyProbe™ change log here.